After a recent run of Historic and Amish fiction, I most recently finished reading a work of contemporary fiction, True to You by Becky Wade. It was a nice change of pace and a reminder that love and challenges transcends time and setting. "What I've learned is that the past might be challenging and the future might be unsure. And that's okay. The present is all we're given, anyway. When we get to the future, God will be there. He'll supply whatever we need for each day." 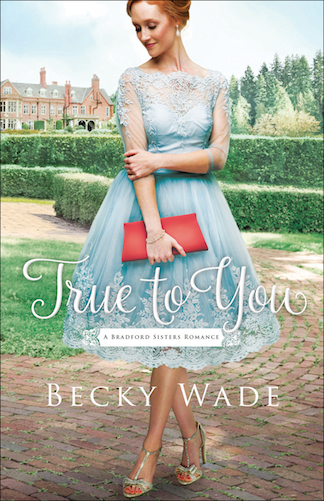 True to You was an enjoyable story filled with heartache and triumph, as the two main characters discovered about themselves and each other and found a path for their own story. I enjoy the way in which she develops her characters and lets things unfold naturally. There is a nice amount of suspense and uncertainty within the story, an anticipation that pulls the reader in wanting to know how things will unfold. In fact, it is the uncovering of the mystery of John's birth mother that brings them together in the first place, as John enlists Nora's aid. But even beyond that, there is that unknown of where things will go and how they will individually and collectively weather what they learn on their journey of discovery. They find strength in their faith, even at times where they feel most certain that it is failing them. I liked Wade's utilization of e-mail, Messenger, and text message exchanges at the end of each chapter to shed light into thoughts and to help provide context to the exchanges happening in the story. Learn more and read additional reviews on the blog tour landing page.